‘Every home should have a keyboard’, a wise person once said, and chances are that you agree, since you’ve found your way here. But you might think ‘I don’t know the first thing about electric keyboards, how can I tell which is the best beginner keyboard when there are so many to choose from?’. This is a very good question and the answer is that you have all the information you need right here! We have listed ten of the top standalone and portable keyboards for beginners and are positive that you’ll be able to find what you’re looking for among them! If you still feel like there are a few questions left unanswered when you’ve read through the reviews we will answer some of the most common questions among beginners. Before you start reading there are a few things you can keep in mind, like who the keyboard is for (adult or child), what budget you have and if there are any special features you want your keyboard to have. Perhaps you require a piano in an upright position, or something similar. What Keyboard is Best for a Beginner? What Kind of Instrument Is a Keyboard Piano? Number of Keys on a Piano Keyboard? Do I Need A Touch Sensitive Keyboard as a Beginner? Do I Need A Full-Size Piano? It’s time to take a look at the amazing pianos for beginner players we’ve found! When you read them through, try to find three or four different ones that you consider, and then you can compare them to each other and look up the video reviews. We’ll start by looking at a really affordable keyboard with lots to offer. Whether you want included stuff or many different voices, this is the keyboard for you! 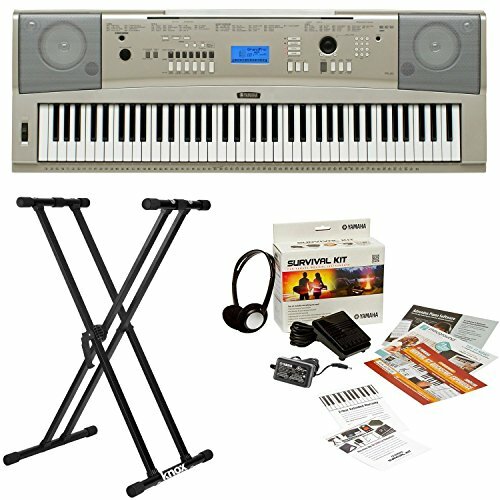 It’s perfect for a beginner who doesn’t want to spend too much, but still wants everything needed to start out playing the keyboard. We found a really good video review for this keyboard, by a guy who looks and talks like a famous actor or a car salesman (it’s hard to decide which one, watch the review and you’ll see what we mean! ), anyway, it’s really good for learning a little bit more about how this keyboard can actually help you to learn how to play, so make sure you check it out! Why We Liked It - We think that this is the perfect keyboard for a child or an adult that just wants to learn for fun and doesn’t require an expensive instrument to do so. 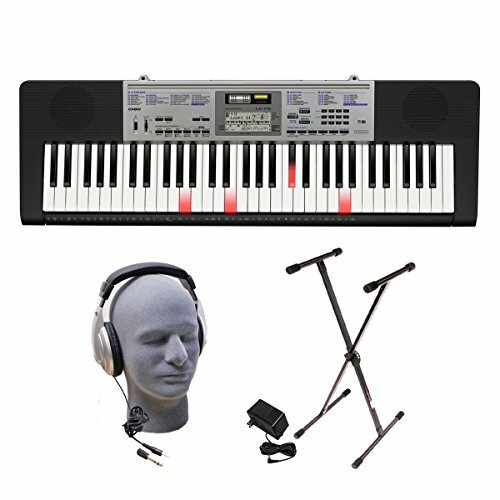 Its has a step-up learning system that helps you both to play melodies and read music, and it is a MIDI keyboard (click here for the full guide) which means you can connect it to a computer for music input, for example. The feel and the tone are of course not as good as more expensive keyboards, but it does what it says on the box and some people are perfectly happy with that. The step-up learning system makes it feel like a game to learn, but we have a feeling that you won’t become a great pianist from just doing that, and chances are that you will grow tired of it quite quickly, so don’t see it as a substitute for real life lessons! It’s nice that you get ok headphones and a stand with it, however it would have been nice to get a sustain pedal as well since they’re kind of important, but of course you can buy one separately and plug in later on. We promise you that no matter if you’re an amateur that just wants to play for fun or a beginner with big music dreams, you will love the Casio WK7600! It offers so many different options, you can truly do anything with it! Here is a short review where you can hear it being played, it sounds great, and you can tell that the reviewer not only knows how to play, but genuinely like this keyboard a lot! Why We Liked It - This is a great keyboard for somebody who loves to play around and try different things. It has 820 tones, which is enough to keep you busy for a year or so minimum, and some of the sounds are really nice! It’s a really good addition to your home studio and will encourage a beginner to practice more, since it offers endless fun possibilities! It’s really unusual to get a sustain pedal with your keyboard, and the fact that one is included here is just wonderful. It’s obvious that this keyboard wasn’t just designed for beginners that doesn’t know how to play, but intermediate and advanced players could definitely use it as well! It’s especially good if you want to try your hands at some music production since it not only has MIDI so that you can connect it to your computer, but also has a 17 track sequencer and a 32 channel mixer. It has amazingly many voices- 820! 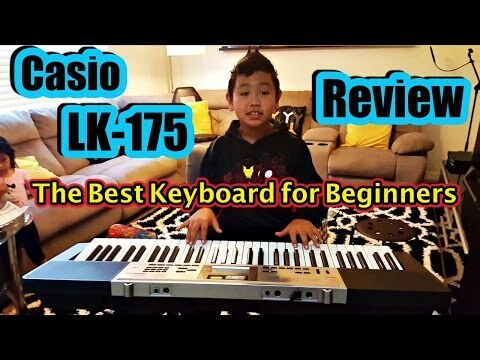 If you’re looking for a keyboard for a kid who is just starting out, the Casio SA76 is great! It has the appearance of a toy, but is still an ok instrument for kids to learn on. The keys are smaller than usual keys which can be good for little fingers, but at the same time that also means that a child will quickly outgrow it, so it’s good to be aware of this before you make your purchase. The keyboard has software that contains 50 different piano lessons, which are by no means a replacement for real lessons with a qualified teacher, but it can be a nice complement that feels more like a game and can encourage the kid to practice. Why We Liked It - We would recommend this keyboard for parents that want to give their kids a keyboard to play around with but at the same time upgrade one step from the toy keyboards from the toy shop. This is not a keyboard you would buy for a child prodigy that will become the next Mozart, but rather for a kid that likes music and needs to be encouraged to eventually start taking lessons. It only has 44 keys and they are smaller than average keys, so you won’t be able to play any advanced songs on this one. Or well, maybe you’re able, but it’s not going to be as enjoyable as having a proper instrument. This doesn’t mean that it’s rubbish, it just means that it fills that step between a toy and an instrument designed for adults. It has 100 different sounds to play around with and 50 rhythms, so it’s a good introduction to improvisation. What if you’re a professional or an intermediate player that wants a keyboard that is as versatile as possible? 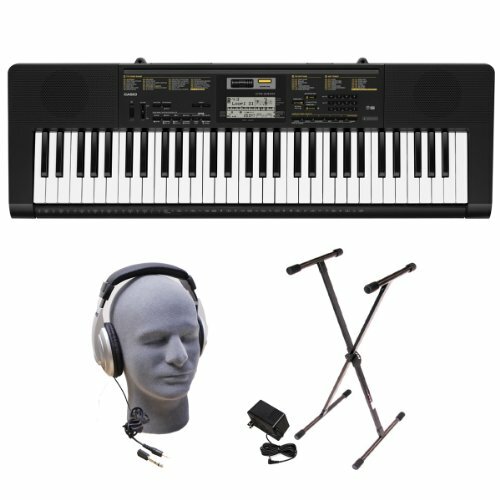 You guessed it, the Yamaha YPG-235 is the keyboard for you! Is it a keyboard or is it a Yamaha digital piano, though? What is the difference between the two anyway? Most often digital pianos have different sounds and rhythms to choose from too, and when it comes to the Yamaha YPG-235 it’s actually difficult to tell whether it should be called a keyboard or a digital piano. 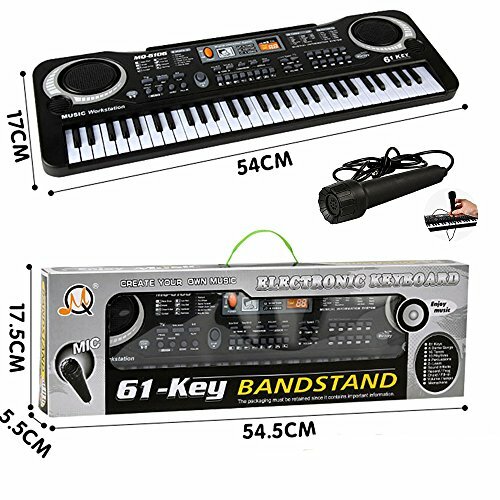 The fact that it only has 76 keys instead of 88keys on this keyboard, which is the normal number of keys on a regular piano can give us a clue, but at the same time those 12 keys are hardly ever used anyway, so it can definitely be used both as a piano for classical music and a keyboard for pop, rock, disco, jazz… You get the idea! Why We Liked It - We really like this keyboard and we think you will do too! It has an almost infinite variety of options, anything you want your keyboard to be able to do, it most likely does! It’s nice to get so many things included, for example a stand and a bench, however we would wish that a pedal was included too, because you will need one if you are going to play anything harder than beginners’ songs. However, pedals aren’t super expensive so it’s not a big deal. If you’ve felt hesitant whether to get a keyboard or a digital piano, we’ve made things easier for you, this is one of the best options out there! With 500 different voices you will never grow tired of this instrument, it’s as versatile as can be. It’s also great to get a 2-year warranty, in case anything should be wrong with it. But the warranty also means that the manufacturer is confident that the product is so good that it won’t be necessary for them to replace it. If you’re starting to feel lost among all the keyboards on the market and you just want to find one that is great and probably has everything you need and more, you’re in luck. 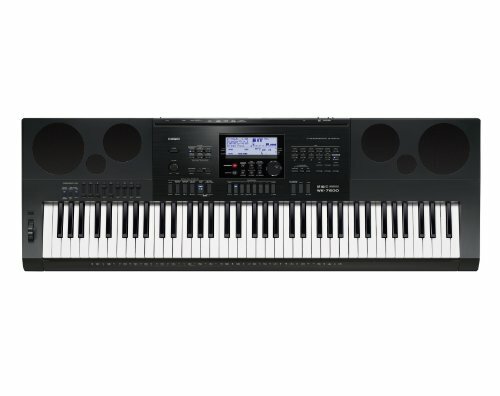 The Yamaha DGX 230 is exactly that type of keyboard. It has 76 keys, 6-track recorder, 489 tones and double stereo speakers. It comes with a stand and headphones, so you can start playing right away. Headphones are particularly useful if you live in an apartment or want to be able to play the keyboard after your kids have gone to bed, for example. 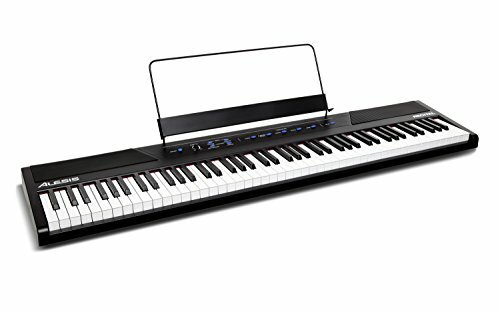 Why We Liked It - This is a great piece of equipment, not only for beginners, but for anybody who wants a cool keyboard that has lots of nice sounds, but still is pretty affordable. This keyboard can almost feel a little bit boring, since it does what you expect, not more, not less. But sometimes all we need from a keyboard is great sounds and high quality, and for that reason we can’t really complain. Sure, it doesn’t have anything unique to offer, but at the same time it’s really good! Even though we’ve included it on our list of beginner keyboards, this keyboard will definitely stay with you a long time, most amateur musicians will not feel a need to replace it with something better since it already has lots of potential. Why We Liked It - This is a good keyboard for beginners, especially young children. The lighted keys make it fun to learn, however we imagine it can be quite frustrating to try to keep up in the more difficult songs. Your kid won’t become a professional pianist just by using the built-in functions, but it’s a fun way of learning that can serve as an introduction to playing the piano, and even a complement to regular piano lessons. It has 400 voices, 150 rhythms and 110 built-in songs, so the possibilities are almost infinite when it comes to creating unique music, however, it only has 61 keys. 61 is probably enough for most kids though, but as they grow older and become better you will probably need to upgrade at some point and buy a better keyboard. It’s still a good option to buy for a beginner, since it’s really affordable. Sometimes it’s hard to tell whether a new hobby will be a long term project or if the new instrument will be forgotten in a couple of months, and then it’s good not to invest too much money initially. This keyboard from Hamzer is the keyboard for all musicians out there that want to spend as little as possible and are prepared to face the consequences. It is by no means great, but if the only thing you need is to be able to play the keys and have sound come out, it will work. This might sound really bad, but there are actually lots of cases where a musician needs to have a functioning piano at home that doesn’t necessarily require amazing sound. One example is if you sing in a choir and need to practice your parts and want to play on the piano to make sure that you’re singing right. Another example is if you prefer to tune another instrument to a piano instead of using a tuner, or if you occasionally want to be able to play your main instrument with keyboard accompaniment if a friend or a teacher comes over to your house. It’s also really good to have a piano when you study music theory, for example when you learn about chords and practice your listening skills. 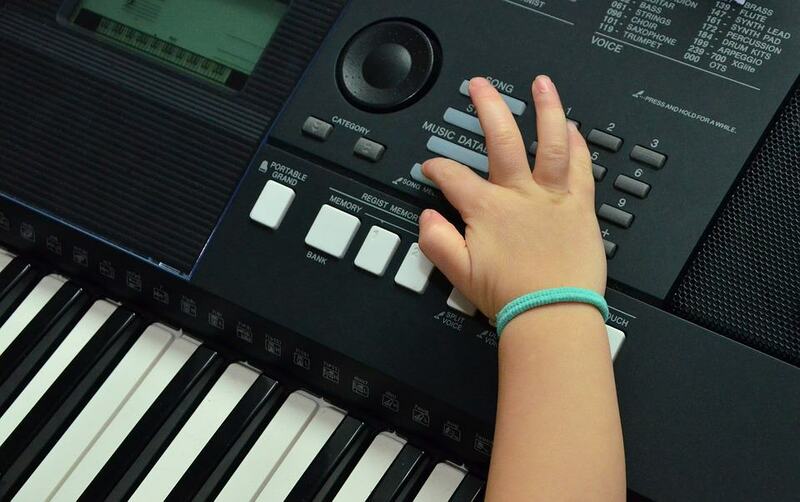 Why We Liked It - This is a good option if you want to buy a keyboard for your young kids or simply want to have a keyboard at home for different musical purposes that doesn’t require amazing sound, for example in your music theory studies. It’s really good that you get a stand and a piano stool with it, so the big things you need to buy in order to get started are already sorted. We think that even if this keyboard doesn’t really compare to the Casios and Yamahas, it’s still good that keyboards like this one exist, because it means that almost everybody can afford to buy one. It has 255 voices and 255 rhythm patterns, so there’s a lot to play around with. The best thing about this keyboard, though, is definitely the price. Who doesn’t love a bargain, right? We think it’s about time we have a look at a keyboard that feels a little bit modern and contributes with something slightly more unique to our list. 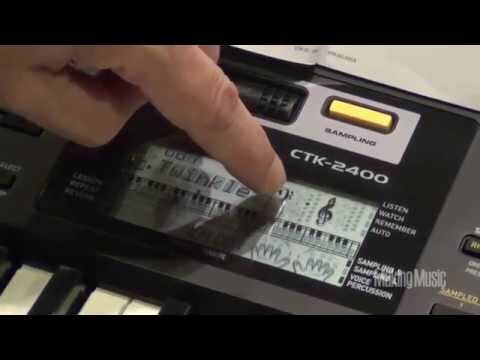 The Casio CTK440 fits right in, it has 600 (!) sounds and 180 rhythms and 152 songs, and already we start to notice that it’s not just like any other keyboard. Why We Liked It - This is a really cool keyboard that has more voices than you can ever use. The possibilities that come with it are endless and it’s a really good product. The only possible downside to it is that is only has 61 keys, but if you don’t want more than that it’s absolutely perfect! It comes with 600 different voices, 180 rhythms and 152 songs, so it can really boost both your skills and your creativity. 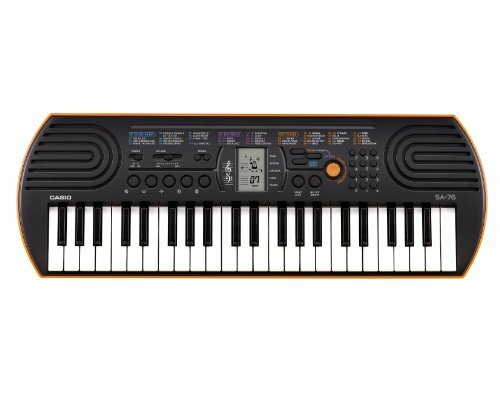 If you are looking for a keyboard to use for your home studio to produce music, this is definitely a keyboard worth looking into! It’s so much more than just a beginner keyboard! A stand is included, which is great, as well as headphones. It might be good to know that the headphones are probably best just to use for the times you want to be able to play silently, for example when you don’t want to disturb others. If you are producing and mixing music you will need better headphones designed for that purpose. We have a feeling that not everybody finding this list is actually looking for a keyboard, but rather a digital piano. Is that the case? The Alesis Recital is a good option. If you have been reading through our list and wonder what on earth you would use 500 different sounds for, and why none of them have 88 keys, chances are that it’s actually a digital piano you’ve been looking for without even knowing it! Why We Liked It - Since this is a digital piano and not a keyboard, it’s hard to compare it to the keyboards on the list, but we thought it would be good to include a digital piano since we’re sure many don’t realize there is a difference. 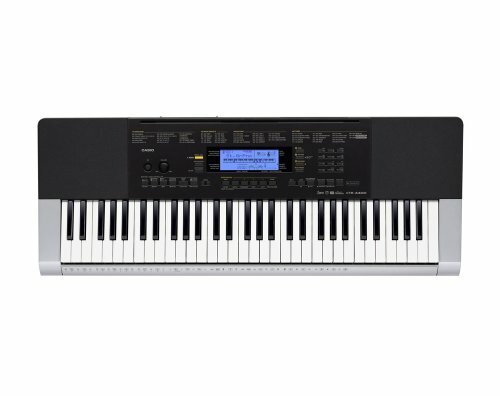 This Alesis is a good digital piano if you just want something basic with 88 semi-weighted keys to practice your scales and arpeggios and all that good stuff! It’s the kind of piano you would buy instead of an acoustic piano. Perhaps you don’t have enough room for one, or you move often and can’t be bothered to move a heavy piano with you. We’ll finish our list with another really affordable keyboard. So what’s special about this one then? Well, not much to be honest, but one great thing is that you’ll get 30 free songs on the Piano Maestro iPad app, and, being a piano teacher myself, I can highly recommend this app. It teaches you how to read music by making it more like a game than a chore, the songs are good and it gives you useful tips every now and then and it’s easy to track your progress. The keyboard only has 54 keys, which is a bit on the low end, but is enough for little kids that just want to play for fun. A stand isn’t included, so you will have to buy one separately or keep it on a table. 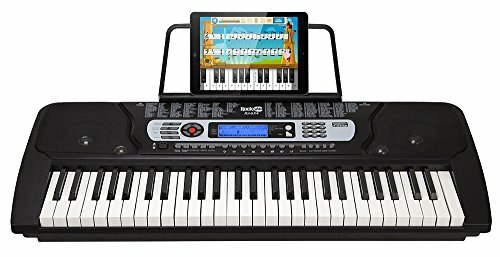 Why We Liked It - This keyboard is good for kids, and especially since you get 30 songs on Piano Maestro, which will really boost your kids learning if he takes it seriously. ‘Every home should have a keyboard’, a wise person once said. Do you agree? We’re pretty sure you do after a quick look at these wonderful instruments. Our list includes everything you need to make a decision, but if you still feel like you would like to try some keyboards out before you make your purchase we recommend you to go to a music shop and try out a few. If you don’t know how to play yet the staff will most likely be able to play some tunes for you so that you can hear different sounds, and even if you don’t know much about keyboards you’re quite likely to find one or two favorites among the different models. 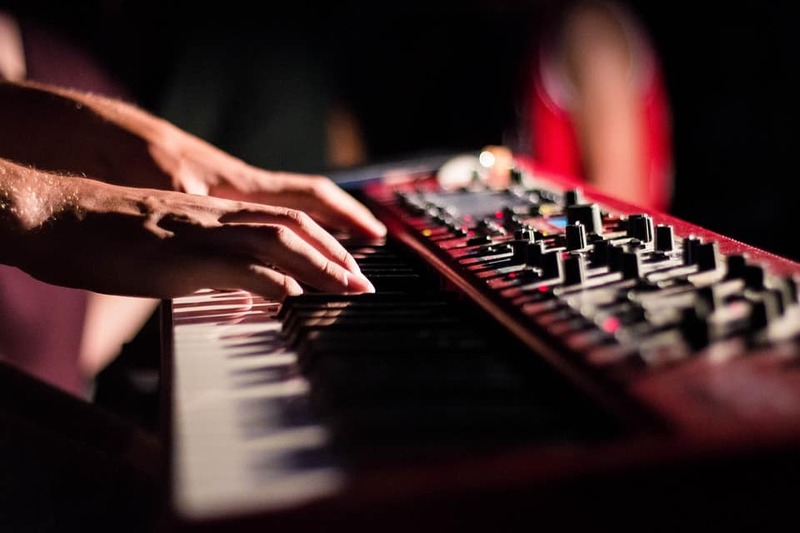 Even if trying different instruments in a music shop is the best way of selecting a keyboard, it can be really good to know a couple of brands and products you’re interested in to narrow it down, there’s so much to choose from! One thing that is good to decide on before you buy a keyboard is how many keys you need. This mostly depends on the skills of the player. To give an example you don’t need many octaves of keys to play ‘Twinkle, Twinkle Little Star’. The number of keys you need depends a little bit on the genre you will play as well. If you are going to not only play pop and rock, but want to play classical piano music as well, it’s probably a good idea to find a keyboard with as many keys as possible. A regular piano has 88 keys, however, most pianist rarely use the highest and the lowest keys. You should also be aware that many keyboards have smaller keys, that are not weighted, which might be annoying when you play classical music. You also need to think about how many sounds you’ll need, most keyboards on our list have a few hundred, which is probably more than you’ll ever use, but it’s really nice to be able to find the exact sound you want. We would recommend you not to worry too much about which keyboard has the best built-in lessons, lighted keys, and so on. Even if these features are nice and can help your kid or yourself progress, it’s a really limited way of learning and chances are it’s only fun the very first week. If you want to learn how to play but can’t afford lessons it’s better to watch YouTube videos and learn that way. All the keyboards on our list are great. It’s impossible to answer which one is best because every beginner is different and needs and wants different things. If you read through our reviews and watch the linked YouTube videos, you’ll be able to determine which keyboard is best for you. Many people feel confused when it comes to keyboards. What’s the difference between a keyboard and a digital piano? The simple answer is: a keyboard has many sounds and is perfect for pop and rock, while a digital piano is what you buy instead of an acoustic piano. It has less sounds to choose from and is just a more convenient instrument to keep at home than a big, bulky piano. Keyboards can have different numbers of keys, it all comes down to what you prefer and need. First, let’s establish what it means that a keyboard has touch sensitive keys. This simply means that the keyboard senses how hard you press, the harder you press, the louder the tone, just like a real piano. This is not a feature that you necessarily need as a beginner, but if you can afford it, it will enhance your music automatically. You will also feel the need for touch sensitivity as you improve. If you are going to use your keyboard for pop, rock and similar music, you probably won’t need a full-sized keyboard. The keys should be cleaned at least once a week. You can use a cloth and a natural cleaning product and wipe them off. Dusting isn’t enough to kill off germs! That an electric piano is a completely different kind of instrument. They work like acoustic pianos and are electro-mechanical, the sound from the strings are converted into electrical signals. For a great beginners guide on starting the piano click here.